We now need to consider how exactly the light and its spatial properties should be represented in a model. We need to decide exactly which quantities are to be used in mathematical equations and numerical data structures. For efficient solutions, this choice should be dependent on the situation. In the simplest case, we can essentially ignore the transverse dimension, assuming a top-hat intensity distribution in the transverse direction: light is assumed to homogeneously fill the fiber core (and not to go beyond it), and we only consider the variation of optical power along the fiber due to amplification, absorption or losses. In the equations we have the optical power Pj(z) for channel j, where the coordinate z varies from 0 to Lf, the length of the active fiber. One usually uses a simple array of power values for each optical channel, where we have a certain fixed longitudinal spacing of the stored values. That spacing should be fine enough for a reasonably accurate representation of the varying power level. The array may have 51 components, for example, for realizing 50 numerical steps in z direction. Only propagating optical powers in z direction is relatively simple, at least for a single pass only. where gj(z) is the local gain. (Typically, signal channels have positive gain values throughout the fiber, whereas pump channels have negative values, indicating absorption.) The normally constant value αj represents additional background losses of the fiber, for example resulting from Rayleigh scattering. (Within a short amplifier or laser fiber, this can often be ignored.) The plus sign applies for forward-propagating channels, and the minus sign for backward-propagating channels. In dynamic simulations (see part 6), the gain values can change with time, e.g. due to saturation effects. The local gain or loss gj depends on details of the laser-active ions and their excitation levels, which themselves can depend on the optical powers of all channels; we will look at that in section 4. Often we are dealing with single-mode fibers. Here, we again have a fixed intensity profile, only that it is not a top-hat profile, but closer to a Gaussian profile. Much of the power is inside the fiber core, but the wings somewhat extend beyond it (see Figure 2). 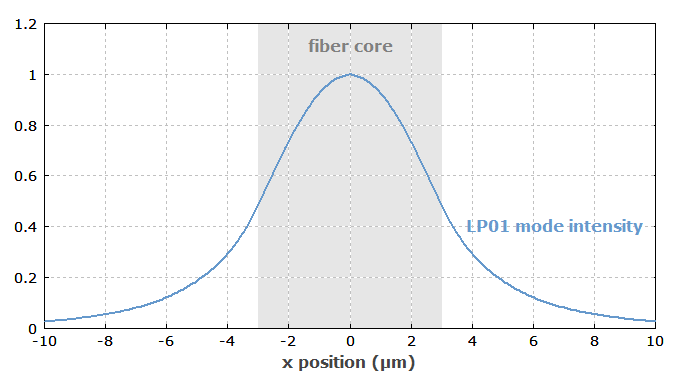 Figure 1: Intensity distribution of an LP01 mode of a step-index fiber. For the simplest extension of the model, the only change with respect to the previously discussed top-hat model is the somewhat reduced overlap of the intensity profile with the fiber core, which results in somewhat smaller values of the local gain or loss gj. This reduction is often described with overlap factors ξj, which can be calculated from the intensity and doping profiles. A more accurate technique is to divide the region of the fiber core into concentric rings, within which the optical intensities do not very that much. One then uses separate overlap factors and excitation levels for all the rings; more on that in section 5. Depending on the situation, different definitions of the transverse intensity profiles are required. One can also define arbitrary intensity profiles based on mathematical expressions or tabulated values. In other cases, one may want to use intensity profiles from fiber modes as calculated with the mode solver. In any case, the software then automatically calculates the required overlap factors. In some cases, one cannot assume a fixed transverse intensity profile, as that profile varies during the propagation and these variations need to be studied. Variations of the intensity profile may result either from changes of the fiber properties (e.g., in tapered fibers) or through propagation effects mostly in multimode fibers. For example, the pump intensity profile in the highly multimode pump cladding of a double-clad fiber can develop a kind of “hole” around the doped core, as pump absorption occurs only in that core. We have discussed this phenomenon in a case study, from which Figure 2 has been taken. Figure 2: Amplitude distribution of pump light along a double-clad fiber with a circular pump cladding. Towards the right end, a “hole” forms in the intensity distribution due to the absorption, which happens only in the small fiber core (near the center). If propagation effects are relevant, the description of the light field must be substantially more comprehensive. When assuming a monochromatic field, one needs to consider a whole transverse distribution of complex field amplitudes (for each z position) rather than a simple power value. Note that not only the optical intensities, but also the optical phases need to be considered, as these have a profound impact on the light propagation. (For example, curved wavefronts can cause light to diverge or converge.) For non-monochromatic fields, one may have to consider multiple frequency components separately. Which numerical method for beam propagation is most efficient depends on the circumstances. For fibers, the well known split-step Fourier method is often quite suitable. The well known split-step Fourier method treats diffraction effects in the spatial Fourier domain. Each step is relatively time-consuming, as it involves two two-dimensional Fourier transforms, but it often allows for a relatively large step size. It can therefore be quite efficient for weakly guiding fibers (with a small numerical aperture). For devices with high refractive index contrast, a finite-difference method may be more appropriate, where the complex amplitude at one point is calculated only from a limited set of points in the previous plane. However, the calculation of the required matrices is a quite difficult subject, and usually one needs to use fairly small longitudinal step sizes. There are mode-based algorithms, which have their own limitations. A lot of phenomena can be investigated with numerical beam propagation. With a suitable simulation software, one can investigate a very wide range of phenomena. For example, one can study the effects of bending the fiber: light is coupled out into the cladding, causing bend losses. Note that the general beam propagation algorithm allows one to study light not only in the core, but also in the cladding – with essentially arbitrary 3D profiles of the refractive index. Other examples are coupling losses at non-ideal fiber splices, multicore fibers, tapered fibers and fiber couplers. Some of these applications are in the area of passive fiber optics. For propagation through an amplifier or laser fiber, one of course needs to take into account the absorption and amplification in the fiber, including saturation effects. 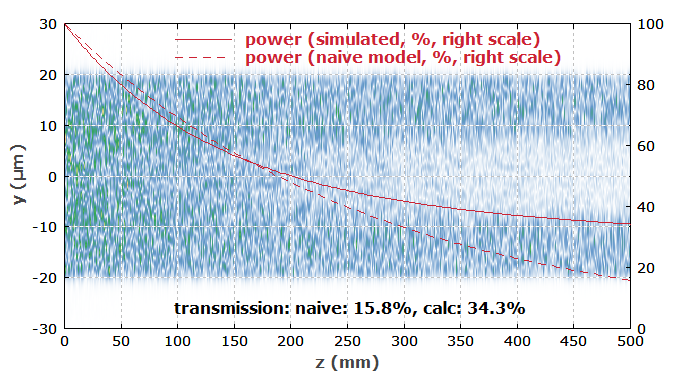 Don't waste time with numerical beam propagation in cases where simple power propagation is sufficient! Generally, the computational effort for numerical beam propagation is far higher than for simple power propagation algorithms, as can be applied in situations with fixed transverse intensity profiles as explained above. Also, it is then hard to find self-consistent solutions (modes) in a laser resonator. Simulation software will often only offer single-pass propagation but not the calculation of self-consistent steady-state solutions for lasers, for example. Concerning double-clad fibers, we have seen that numerical beam propagation can be used to investigate certain pump absorption phenomena which would be overlooked in the simplified model, assuming a fixed intensity profile for the pump light (for example, a top-hat distribution). On the other hand, the numerical effort becomes substantially more severe. Therefore, in practice one has to decide whether the mentioned type of phenomena are of interest. If the main aspect to be studied lies in a different field – for example, phenomena related to processes within the fiber core –, one may decide to use a simplified model, being aware that the pump absorption is not very accurately modeled. One should keep in mind that the best model is not necessarily the most accurate one, but rather the one which is most suitable for the job to be done. Go to Part 4: Continuous-wave operation of amplifiers and lasers, or back to the start page.